Functional dairy foods for promotion of health and prevention of diseases. Citation: Vasquez EC. Functional dairy foods for promotion of health and prevention of diseases.. J Food Microbiol 2018;2(1):7-8. The link between food and health dates back thousands of years ago in the ancient Greek civilization. Hippocrates who is considered the founding father of modern medicine emphasized that disease is not caused by gods or spirits but by a natural process and that food greatly contributes to the improvement of health of the human being. Nevertheless, public domain data show that in the present moment more than 80% of reason people go to the hospital is related to the poor state of nutrition. This dramatic situation is a challenge for science and governments that together need to solve the problem, which motivated the production of the famous documentary Food Matters, about worldwide food industry and proposing some scientific solutions for overcoming illness naturally. Functional foods (source: Food and Nutrition Board of the National Academy of Sciences) or natural products or nutraceuticals (source: Foundation for Innovation in Medicine) are those, original, enriched or modified foods that provide health benefits beyond the provision of essential nutrients. Functional foods must be used as a supplement of a varied diet on a regular basis and at effective levels (American Dietetic Association). A growing number of experimental and clinical studies have successfully demonstrated the beneficial effects of functional foods or nutraceuticals when used as adjunctive therapy in animal models and patients with different chronic diseases, as reviewed by others [1,2]. Although a great percentage of health-promoting foods are derived from plants, there are several classes of active functional food ingredients of animal or microbial origin. In terms of timing, the old global idea that bacteria were only disease-causing agents, was challenged in 1910 by the Nobel Prize Laureate Elie Metchnikoff, considered the father of probiotics, who theorized the beneficial effects of diet supplemented with lactic acid bacteria. Therefore, although it still is recognized as of great relevance the modern drug therapy for the human being, is increasing the number of research designed to demonstrate the effectiveness of diet supplemented with functional foods, including those derived from milk fermented with microbes [3-5]. The most important segment within functional fermented foods are those being consumed to improve gastrointestinal health such as probiotics, prebioics and symbiotic [1,2]. Probiotics are biomodulators composed of live bacteria and other microorganisms, which when administered in adequate amounts, are expected to prevent or correct the gut microbiota and to promote health benefits to the host (Figure 1). This is the reason probiotics have been of great interest in science and in the segment of food industry worldwide. Human probiotic microorganisms belong mostly to the geni: Lactobacillus, Bifidobacterium, and Lactococus, Streptococcus, Enterococcus usually presented in fermented foods . The effect of probiotics can be augmented by adding non-digestible food components such as inulin and some oligosaccharides, which are known as prebiotics . This combination improves the survival of probiotic microorganisms in the gastrointestinal tract without (or with limited) effect on other microorganisms. The combination of synergistically acting probiotic and prebiotic is called a symbiotic. This diet supplement has been used to the improvement of health and protective action against diverse disturbances, including irritable bowel syndrome, cancer, ulcerative colitis, allergic diseases, and obesity in humans. The actions of probiotics are mediated by multiple, mutually linked mechanisms like increased intestinal adhesion and limiting the colonization of less beneficial bacteria, production of metabolites such as poly-unsaturated fatty acids and release of antibacterial molecules. The mechanisms by which functional food promotes health include improvement of the intestinal microbial balance and activity, immune-stimulation, suppression of mutagenesis and carcinogenesis. Figure 1. 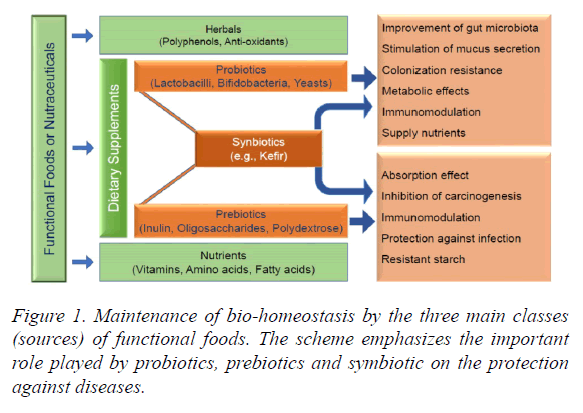 Maintenance of bio-homeostasis by the three main classes (sources) of functional foods. The scheme emphasizes the important role played by probiotics, prebiotics and symbiotic on the protection against diseases. Therefore, we are facing a growing increase in research designed to screening and identification of novel biologically active natural compounds . This is also an opportunity for the sectors of food industry promote investments in the formulation of new functional food or nutraceuticals for the improvement of health and prevention or rehabilitation of diseases. Laparra JM, Sanz Y. Interactions of gut microbiota with functional food components and nutraceuticals. Pharmacol Res. 2010;61(3):219-25. Pereira TM, Pimenta FS, Porto ML, et al. Coadjuvants in the Diabetic Complications: Nutraceuticals and Drugs with Pleiotropic Effects. Int J Mol Sci. 2016;5:17(8). Singh RK, Chang HW, Yan D, et al. Influence of diet on the gut microbiome and implications for human health. J Transl Med. 2017;8:15(1):73. Vasquez EC. Gut dysbiosis and food microbiology: scientific advances and open opportunity to publish articles. J Food Microbiol. 2017;1(1):1-2. Yasmeen R, Fukagawa NK, Wang TT. Establishing health benefits of bioactive food components: a basic research scientist's perspective. Curr Opin Biotechnol. 2017;44:109-114. Rosa D, Dias M, Grześkowiak Ł, et al. Milk kefir: nutritional, microbiological and health benefits. Nutr Res Rev. 2017;30(1):82-96. Flint HJ, Salminen S, Calder PC, et al. Expert consensus document. The International Scientific Association for Probiotics and Prebiotics consensus statement on the scope and appropriate use of the term probiotic. Nat Rev Gastroenterol Hepatol. 2014;11(8):506-14. Newman D. Screening and identification of novel biologically active natural compounds. F1000Res. 2017;5;6:783.